There are seven denominations of Canadian coin: 1¢, 5¢, 10¢, 25¢, 50¢, $1, and $2. The 50¢ coin is rarely encountered. 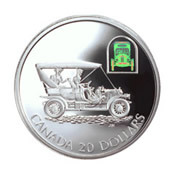 Coins are produced by the Royal Canadian Mint in Winnipeg, Manitoba. 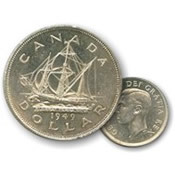 5¢ is called a nickel, 10¢ a dime, 25¢ a quarter, 50¢ a 50 cent piece, $1 a loonie, and $2 a toonie. 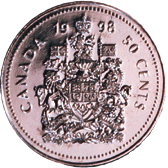 The last 1¢ (penny) to be minted in Canada was struck on Friday, May 4 2012. The first paper money issued in Canada denominated in dollars were British Army bills, issued between 1813 and 1815. Canadian dollar bank notes were later issued by the chartered banks starting in the 1830s, by several pre-confederation colonial governments (most notably the Province of Canada in 1866), and after confederation, by the Dominion of Canada starting in 1870. Some municipalities also issued notes, most notably depression scrip during the 1930s. In 1935, with only 10 chartered banks still issuing notes, the Bank of Canada was founded. It took over the federal issuance of notes from the Dominion of Canada. It began issuing notes in denominations of $1, $2, $5, $10, $20, $25, $50, $100, $500 and $1000. In 1944, the chartered banks were prohibited from issuing their own currency, with the Royal Bank of Canada and the Bank of Montreal among the last to issue notes. Significant design changes to the notes have occurred since 1935, with new series introduced in 1937, 1954, 1970, 1986, and 2001. In June 2011, newly designed notes printed on a polymer substrate, as opposed to cotton fibre, were announced; the first of these polymer notes, the $100 bill, began circulation in November 2011, the $50 bill began circulation in March 2012, and additional denominations will follow before 2013. The $1.00 coin was released on June 30th, 1987 replacing the one dollar banknote. The introduction of the coin was successful in achieving public acceptance and quickly because the "pet" of Canadian coins. "Loonie", the nickname Canadians gave their new coin, became so widely recognized that in 2006, the Royal Canadian Mint secured the rights to the name "Loonie". 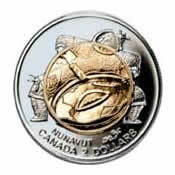 Toonie is the nickname Canadians collectively gave their new $2.00 coin when it was introduced on February 19th, 1996. Newfoundland entered Canadian Confederation on March 31, 1949. John Cabot landed in Newfoundland in 1497. 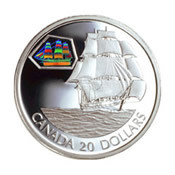 His ship, the Matthew, is depicted on the coin. Nunavut is the newest and largest of the Canadian territories. The boundaries were establish in 1993 and Nunavut officially separated from the Northwest Territories joining Canada on April 1, 1999. A special $2 coin was issued. 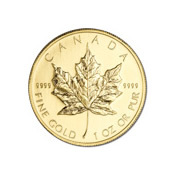 The 24 carat Canadian Gold Maple Leaf, is the official bullion gold coin of Canada. With a gold content of .9999 millesimal fineness, coins minted between 1979 and 1981 have the the purest gold coin of regular issue in the world. 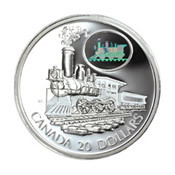 The first ever colourized coin was issued on Canada Day, July 1, 2000, in celebration of the Millennium. Only 25,000 coins were minted. 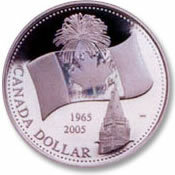 The 2005 Silver Dollar celebrates the 40th Anniversary of Canada's National Flag adopted February 15th, 1965. 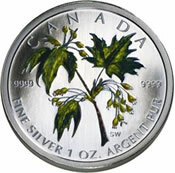 The 2003, 99.99 Silver coin is adorned with the Maple Leaf and spring blossoms. 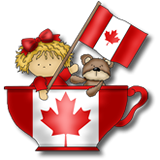 The Maple Leaf is the most recognized of all Canadian emblems. Only 35,000 coins were minted. The Scotia Locomotive was built in Hamilton, Ontario in 1861. To combat the freezing Canadian winters, it was the first locomotive to use a steel boiler. Only 15,000 coins were minted. The Marco Polo, built in Saint John, New Brunswick in 1851, was the first ship to circumnavigate the world in less than six months. Only 15,000 coins were minted. The Russell Model L Touring Car, manufactured in 1908 by the Canadian Cycle & Motor Company Ltd., was rugged and dependable; built to withstand the treacherous roads and harsh climate. It was Canada's first successful automobile. Only 15,000 coins were minted. 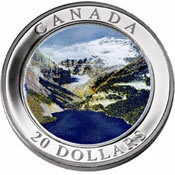 In honour of Remembrance Day, the world's first coloured circulation coin was unveiled on October 21, 2004. 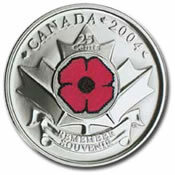 The 25-cent coin features a red poppy, the symbol that pays homage to Canadians who died in the service. 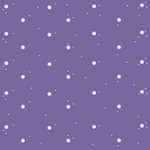 30 million coins were released: one for each Canadian. 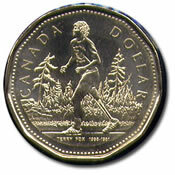 On March 14, 2005, the 25th Anniversary of the Terry Fox's Marathon of Hope, the Royal Canadian Mint unveiled the Terry Fox Dollar. A Canadian Hero, he is the first ever Canadian to be featured on a circulation coin. More information about Terry Fox.